Well … kind of! NZL 32 aka Black Magic will be barged tomorrow morning from Team New Zealand’s shed in Auckland’s Viaduct Harbour to its new home within the National Maritime Museum’s Blue Water Black Magic – A Tribute to Sir Peter Blake exhibition, opening in December this year. The new exhibition wing at the National Maritime Museum, Auckland. ©NMM Collection. It was Sir Peter’s wish that NZL 32 become part of the national collection and, in 2003, the yacht was gifted to Te Papa. 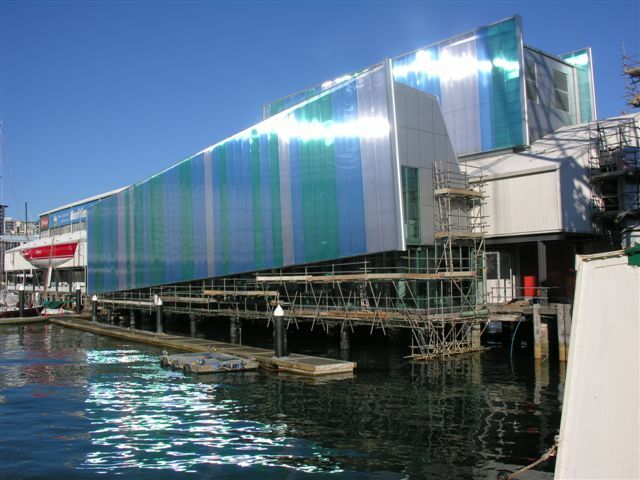 Since that time, Te Papa and the National Maritime Museum have worked together to develop a fitting tribute to Sir Peter’s contribution to New Zealand yachting. The National Maritime Museum have also started a blog detailing the development of the exhibition and behind the scenes insights as it is installed. You can watch the yacht being moved into its new home on TVNZ’s Breakfast programme with Tamati Coffey reporting live from the Maritime Museum from 6am tomorrow.